The new issue of Immunology News, the British Society for Immunology's magazine, is now out for you to read online. In the first issue of Immunology News of the year, you will meet new board members and learn how you can elect representatives at this year's elections opening on 2 April. You will also find out what to look forward to in our 2019 Congress taking place in Liverpool on 2–5 December. In this new issue, we feature an interview with Martin Raff, author of one of the stand-out papers of our official journal Immunology. Additionally, we take a look into how the media and scientists can work together to ensure evidence-based stories with the BSA media fellowship and how the BSI is representing immunology with the Connect Immune Research parliamentary event. 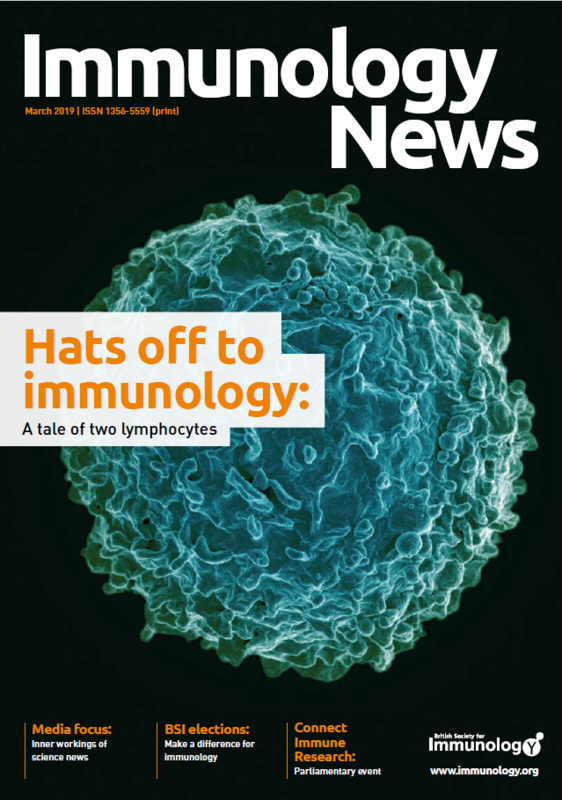 You can access the online version of Immunology News via the publications section of our website - you no longer have to log into the membership area to read it. You can either download the full pdf of the magazine or selected articles have been uploaded to individual webpages for ease of reading online or via mobile devices.